Dress and cape have velcro fastening. 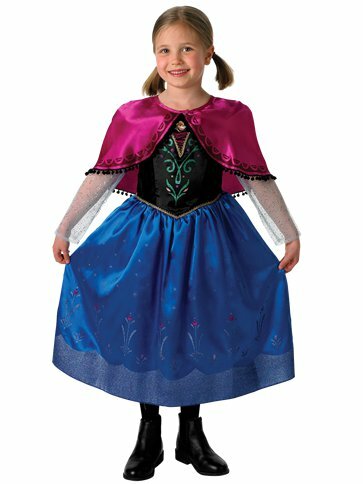 This officially licensed, Disney Anna costume features a regal gown with long, glitter sleeves, black satin bodice with character print and gold braid trim, a royal blue skirt with matching glitter flower print and a short base layer for added volume; also included with this adorable princess costume is a pretty pink shoulder cape with tassel trim. A fabulous costume based on a strong minded and optimistic Disney character, an inspiration to wannabe princesses all over the globe! Want it Friday, 26 April? Order it within 16hrs and 8mins and choose Premium by 9pm Delivery at checkout.